Coal use has dropped in all but two states since 2007, a new analysis shows — adding to the growing evidence of the fossil fuel’s continued decline. A U.S. Energy Information Administration report released Thursday shows demand for coal increased in only Alaska and Nebraska. 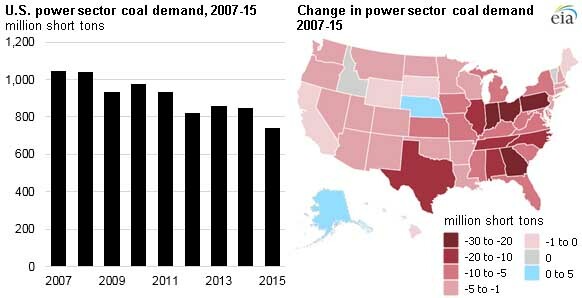 In Texas, which consumes the most coal, use of the fossil fuel dropped 16 percent from 2007 to 2015. In other major coal-reliant states such as Indiana, Ohio and Pennsylvania, demand dropped 37 percent, 49 percent and 44 percent, respectively. Idaho, Rhode Island and Vermont saw no change, because their energy sectors do not consume any coal. The report names the low price of natural gas, which has become more readily available because of fracking, as a major contributor to the decline. It also notes that use of solar and wind power has increased in recent years. Coal use has been on the decline for some time. Aging coal plants are closing across the country, and earlier this month, the nation’s largest coal provider, Peabody Energy, filed for bankruptcy protection. In addition to the boom in natural gas, the company blamed a weak Chinese economy and regulatory changes for its decision. Last year, the Obama administration issued a regulation that would require states to make major cuts to their greenhouse gas emissions, with the goal of cutting emissions nationally 30 percent by 2030. The regulation is on hold pending a Supreme Court decision.